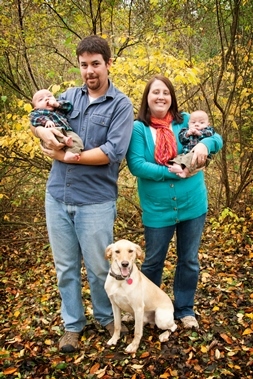 During her first ultrasound, Melissa Haen discovered she wasn’t having just one baby, but two. That’s when her small-town doctor referred her to the maternal-fetal medicine specialists at Methodist Women’s Hospital Perinatal Center. At 18 weeks, she learned her identical twin boys would share more than just a womb, but a rare, life-threatening condition. Diagnosed with Twin-to-Twin Transfusion Syndrome (TTTS), the identical twins shared one placenta. This rare condition puts cardiovascular stress on one twin and may cause fetal death in the other. Throughout her difficult pregnancy, she leaned heavily on the expert care she received at Methodist. The game plan included fetal surgery in Colorado, and when Melissa’s pregnancy reached 29 weeks, she was admitted to Methodist Women’s Hospital for the rest of her pregnancy. At birth, Lincoln weighed just 3 pounds 14 ounces and Nolan weighed 2 pounds 11 ounces. Both were admitted to the Neonatal Intensive Care Unit (NICU) at Methodist Women’s Hospital. Lincoln stayed in the NICU for 8 weeks and Nolan was sent home after 11 weeks. Photo courtesy Aimee Slater Photography.